The Santa Maria sopra Minerva. The Santa Maria sopra Minerva is one of the richest churches in Rome. There is so much to see and so much to tell about the history of this church and its treasures, that one could easily write multiple dissertations about it. I will just stick to what I usually do: write about what I can actually show my readers. My first visit to the Santa Maria was in 1996, during my high school trip to Rome. Although I apparently did not take any pictures, I still vividly remember that I was much impressed by the dark blue ceiling with stars inside the church. I have returned to the Santa Maria many times since 1996, and have on each occasion learned more and more about this intriguing church. For example, on my visit in 2013, I managed to miss Fra Angelico’s tomb, as I did not know it could be found here. Fra Angelico (ca. 1395-1455) was a fifteenth century painter who was especially known for his work in Florence. He died in Rome and was interred in the Santa Maria. I did spot the tomb when I was back in January 2017, and then also discovered that the architect and sculptor Andrea Bregno (ca. 1418-1503) was buried here. Now let us have a close look at the church. ‘Sopra Minerva’ means ‘on top of Minerva’ and seems to refer to a church built over a pagan temple dedicated to the Roman goddess of wisdoms and arts. This is the story that is told in two of my travel guides, but there is serious doubt as to whether this story is actually correct. This part of Rome was known as the Campus Martius in Antiquity. Originally, during the Early and Middle Republic, this was an open space outside the Servian city walls were the Roman legions exercised and meetings of the popular assembly, especially the comitia centuriata, were held. As Rome grew ever larger, many buildings were erected on the Campus Martius and the Field of Mars became de facto part of the city. Elections were held in a rectangular wooden structure called the Ovile (‘sheep pens’). This was later replaced by a splendid new marble building, actually a colonnaded piazza. It was called the Saepta Julia, or ‘Julian enclosures’. 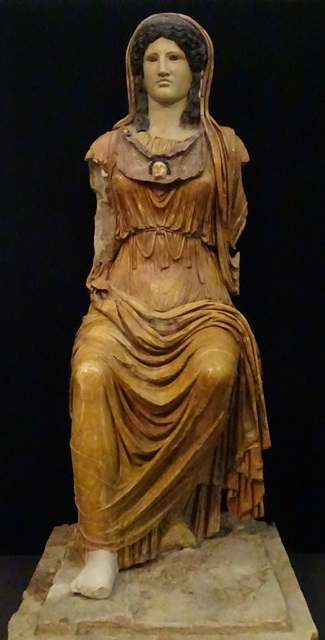 Polychrome statue of Minerva (Museo Nazionale Romano). The plan to build the Saepta Julia is generally attributed to Gaius Julius Caesar, but the building was not completed until 26 BCE, when the Saepta were dedicated by Marcus Vipsanius Agrippa. Since the popular assemblies had lost much of their power and prestige when Rome had become a de facto monarchy, the Saepta were mostly used for non-electoral purposes, such as gladiatorial fights. Some reconstructions of the building show a temple of Minerva in the northern part of the premises, next to the Pantheon. However, the truth seems to be that there was no temple of Minerva at this site in Antiquity, although a small circular shrine dedicated to her could be found some 100-200 metres to the east of the present church. So all in all, it is probably safest to assume that the current church was built over part of the Saepta Julia and perhaps a small part of the Temple of Isis and Serapis (the Isaeum and Serapaeum) as well. This double temple was just to the east of the Saepta and dedicated to the two Hellenistic-Egyptian gods (to learn more about these syncretistic deities, see Crete: Gortys). The obelisk in front of the Santa Maria is definitely from the temple. The ‘talking statue’ Madama Lucrezia – who can be found next to the San Marco – may also originally have been part of the temple, if she does in fact represent the goddess Isis or a priestess of Isis. Rich interior of the church. 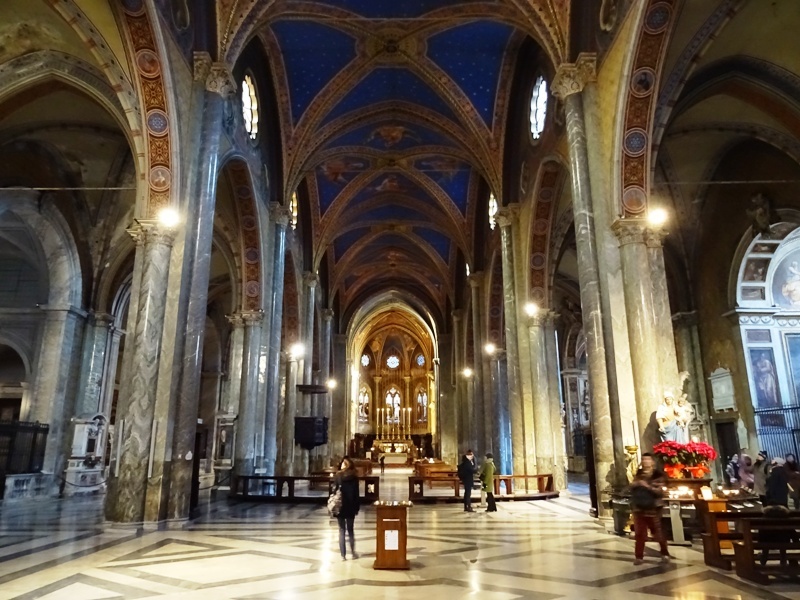 The Santa Maria sopra Minerva is the only medieval Gothic church within the walls of Rome. The first church at this site was built between the seventh and ninth century. In 1276, it was given to the Order of the Dominicans, who up until then had used the Santa Sabina on the Aventine as their base. The Dominicans almost immediately made plans to completely rebuild the church and to add a large monastery to it. Construction started in 1280 and got off to a flying start, but it was slowed down significantly when the French pope Clemens V (1305-1314), under severe pressure from King Philip IV of France, moved the papal seat to Avignon in 1309. The popes did not return to Rome until 1367, before leaving for Avignon again in 1370. One of the people who tried to persuade the pope to return to Rome again was the Italian mystic and tertiary of the Dominican Order Catherine of Siena (1347-1380). Debate continues about whether or not it was really her eloquence that finally brought Pope Gregorius XI back to the Eternal City in January 1377, but it is certain that Catherine was very influential in her own time. Pope Gregorius XI died in 1378, and after his death a feud between Italian and French cardinals erupted. The Italians elected their favourite Bartolomeo Prignano as Pope Urbanus VI, while the French made sure that Robert of Geneva was elected as Pope (now Antipope) Clemens VII, not to be confused with the ‘real’ Pope Clemens VII, whom I will discuss in just a minute. The election of two popes, who immediately excommunicated each other, led to the Great Western Schism, with one pope ruling from Rome and the other from Avignon. In 1409, the Ecumenical Council of Pisa was convened to try to end the conflict. It was a disaster: instead of one pope, Western Europe ended up with three. The Schism was not ended until 1417. 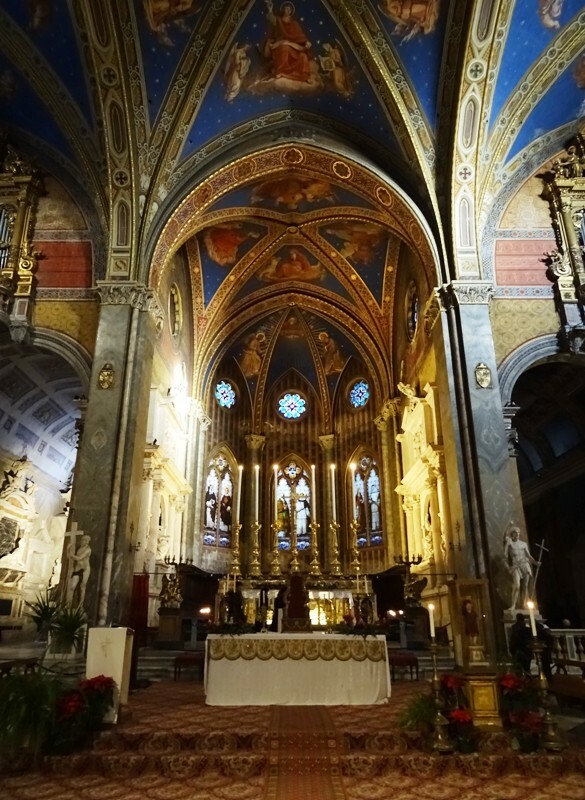 In the mean time, little work seems to have been carried out on the Santa Maria sopra Minerva, and construction was apparently only resumed in 1453. A facade was added in this year, but it was left unfinished. Nevertheless, the Santa Maria was obviously an important church. Two papal conclaves took place in this church after the Great Western Schism had been mended. Pope Eugenius IV (1431-1447) was elected here in 1431 and his successor Pope Nicholas V (1447-1455) was also elected in this church in 1447. At that time, the Lateran Palace was in ruins and Old Saint Peter’s Basilica was falling apart too. 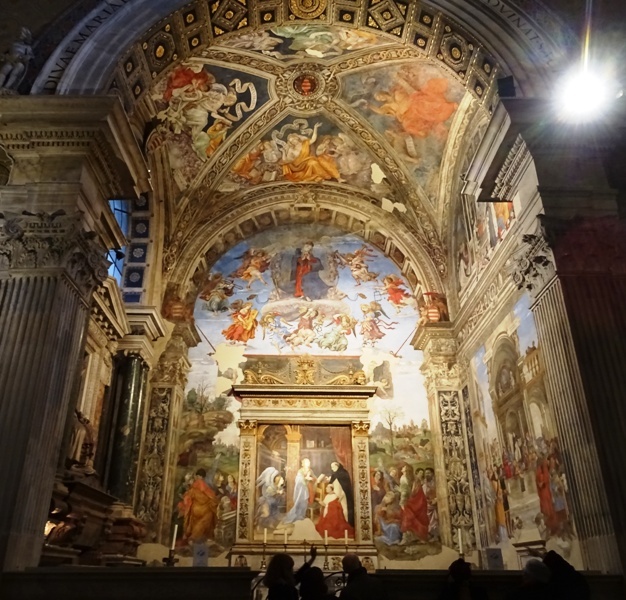 The Sistine Chapel had not yet been built and apparently the sacristy of the Santa Maria sopra Minerva was a suitable location for the most important ceremony in all of medieval Christendom. The facade of the church was altered in 1600 by Carlo Maderno (1556-1629). Again, the work was not finished: the intended Baroque ornamentations were never added. What is left is a plain and simple, undecorated Renaissance facade that is neither Gothic (although the rose windows are) nor Baroque. The glory years of the Dominican Order were in the sixteenth and seventeenth century. The great Dominican theologian Thomas Aquinas (ca. 1225-1274) was declared a Doctor of the Church in 1567 by Pope Pius V (1566-1572), who was himself a member of the Dominican Order. The Dominicans were very much involved in the Inquisition and became known as the domini canes, the dogs of the Lord. The seat of the Inquisition was moved to their monastery in Rome in 1628, and it was here that the notorious trial against Galileo Galilei took place in 1633. 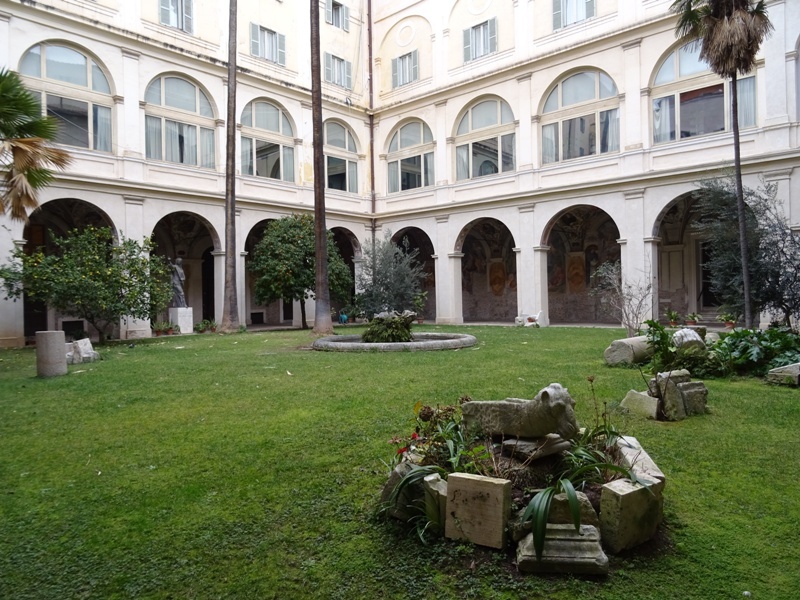 Cloister of the Santa Maria sopra Minerva. The Dominicans carried out a large restoration of the Santa Maria between 1848 and 1855, removing Baroque elements that had been added in previous centuries and trying to restore the medieval Gothic look of the church. When Catherine of Siena died in 1380, she was originally buried outside the church, but was moved to the Cappella Capranica inside the basilica in 1451. She can still be found in the church, but her tomb was moved again after the 1855 restoration, this time to a shrine under the high altar. Her head was apparently severed from her body shortly after her death and taken back to Siena, where she had been born into a family of 25 children. Catherine is perhaps the most ‘decorated’ woman in the Catholic Church after Maria herself. She was canonised in 1461, made a Doctor of the Church in 1970 and named patron saint of Rome (1866), of Italy (1939) and of Europe (1999). 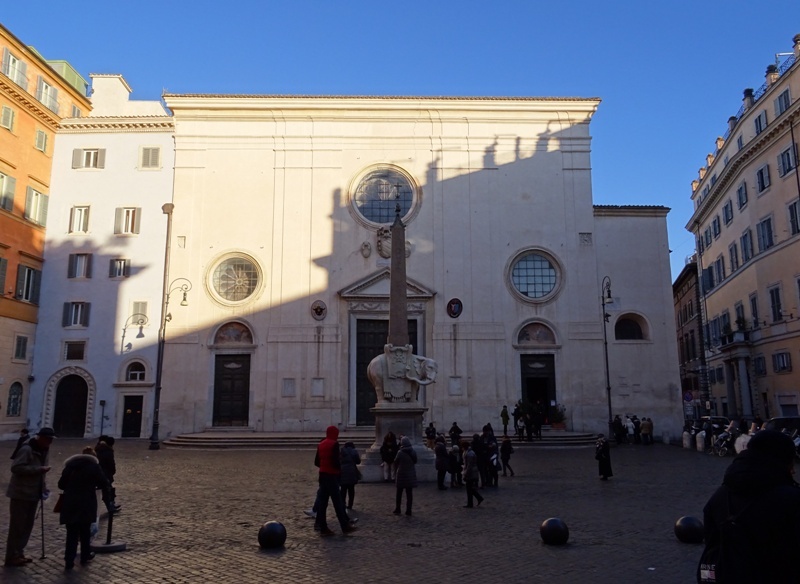 The elephant carrying an ancient Egyptian obelisk in front of the church was designed by Gian Lorenzo Bernini, but it was actually sculpted by one of his pupils, Ercole Ferrata (1610-1686), in 1667. Because of its diminutive size, it is known as ‘il porcino’ (little pig) or ‘il pulcino’ (little chick). The elephant has a long saddle-cloth, which reaches all the way to the base of the statue. 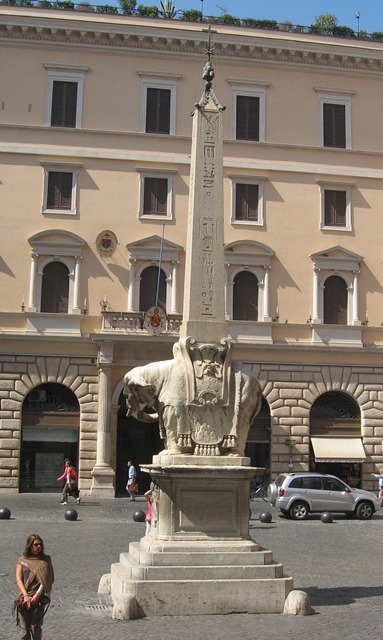 This is apparently because some of the Dominican friars were afraid the elephant would not be able to carry the weight of the obelisk and might fall over. Bernini of course knew that this was hogwash, but nevertheless decided to comply with the friars’ demand that no void be left underneath the elephant’s belly. The story continues and relates that, in revenge, Bernini designed the elephant to be placed with its arse facing the Dominican monastery. The elephant carries a sixth century BCE obelisk from the reign of the pharaoh Wahibre Haaibre, known as Apries in Greek sources. Wahibre Haaibre ruled from Sais in the Nile Delta and was pharaoh from 589 until 570 BCE. His reign was troubled, and in 570 BCE his army suffered a crushing defeat against the Greek colonists of Cyrene, who had come into conflict with the Libyans, Egypt’s western neighbours. The defeat led to a civil war, in which Wahibre Haaibre was killed. The pharaoh had the obelisk discussed here erected and dedicated in his capital Sais. It was moved to Rome in the third century CE by the emperor Diocletianus (284-305) to be placed in the Isaeum and Serapaeum. The Dominicans that were in charge of the church and monastery found it buried in 1655 and after digging it up ordered Bernini to use it as decoration for the church. The obelisk itself is 5.47 metres tall. Together with Bernini’s elephant and the cross on top, it reaches a height of over 12 metres. The visitor will notice that the arches in the nave are actually pointed and not rounded, which marks this church as a Gothic church. The Santa Maria has beautiful stained-glass windows, which are from the nineteenth century restoration. The vaulted ceiling is also from this restoration. It is both beautiful and impressive, with the dark blue colours and the stars symbolising heaven. One of the church’s great treasures stands to the left of the high altar. It is Michelangelo’s Risen Christ. The story of the statue is a bit complicated. The great artist began work on the statue in 1514, but discarded it when he discovered a disfiguring black vein in the marble. Michelangelo began work on a second Risen Christ in 1519, but left Rome two years later and delegated the work to his pupil Pietro Urbano. Urbano was apparently not very competent, so the relatively unknown Federico Frizzi had to take over and finish the statue. 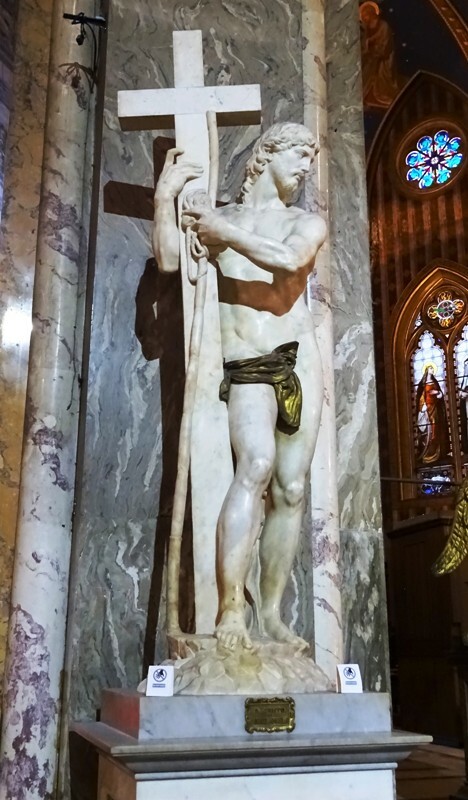 Christ was originally naked, but a bronze loincloth was later added for modesty’s sake. The sculpture also once had a bronze halo and a sandal protecting his right foot from the kisses of churchgoers, but both have been removed. Touching the feet is now prohibited. The apse contains the two huge funerary monuments for two popes from the De’ Medici family, Leo X and Clemens VII (the ‘real’ Clemens VII). Leo was the son of Lorenzo il Magnifico, ruler of Florence. He was pope from 1513 until 1521 and was succeeded first by the only Dutch pope in history, Adrianus VI (whose tomb can be found in the nearby Santa Maria dell’Anima), and then by his cousin Giulio, who chose the name Clemens VII (1523-1534), a name that had been contaminated by an antipope (see above). The splendid tombs were executed by Raffaello da Montelupo (ca. 1505-1566), Baccio Bandinelli (1493-1560) and Nanni di Baccio Bigio (died 1568). Tombs of Popes Leo X (left) and Clemens VII (right). The tombs were in fact the main reason I came back here in 2013. I was in Rome with a friend who has a Dutch-Reformed background. In the Dutch-Reformed tradition, Leo X has a terrible reputation, almost as bad as the Antichrist himself. This is mostly because of his unbridled trade in indulgences, which was necessary to finance the construction of New Saint Peter’s Basilica. My friend really wanted to see the tomb of the man he had been taught in school to hate (he is now less resentful by the way; Leo X has been pardoned). Of all the chapels in the church, I consider the Carafa Chapel to be the most beautiful. It is deservedly famous for its magnificent frescoes by Filippino Lippi (1457-1504). 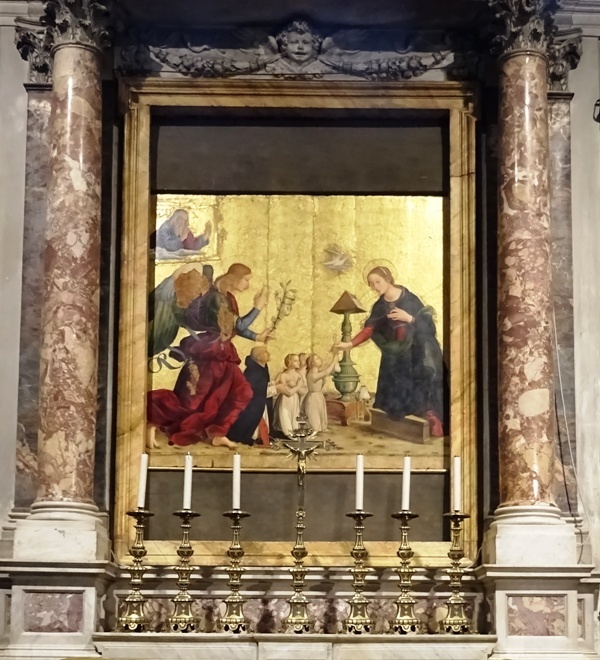 The altarpiece is Saint Thomas Aquinas presenting Cardinal Carafa to Our Lady. Saint Thomas is wearing the white habit and black cloak of the Dominicans and the kneeling Cardinal Carafa is wearing the scarlet robes of a cardinal. His full name was Oliviero Carafa (1430-1511) and he commissioned the Carafa Chapel in 1489. The bottom part of the altarpiece is somewhat damaged, as is the wall fresco behind it. This is the result of Tiber floods in the past. The wall fresco shows The Assumption of Our Lady, while the right hand wall has The Triumph of Saint Thomas. There used to be a third fresco on the left hand wall, but it was destroyed to make room for the tomb of Pope Paulus IV (1555-1559). This pope was born as Gian Pietro Carafa, and as a member of the Carafa family, he was destined to be interred here. Still, it is a pity that Lippi’s fresco had to be chiselled away, especially because Paulus IV was a horrible pope and people in the streets of Rome cheered when he died. Paulus was responsible for the introduction of the Index of Prohibited Books and locked the Jews in Rome up in a ghetto. His foreign policy, marked by anti-Spanish sentiment, was a disaster. The Santa Maria sopra Minerva has the papal tombs of Popes Leo X, Clemens VII and Paulus IV, but also those of Urbanus VII (1590) and Benedictus XIII (1724-1730). Urbanus’ papacy in 1590 lasted just 13 days and was the shortest in history. In 1606, he was given a grand funeral monument in the fifth chapel on the right, the Chapel of the Annunciation. 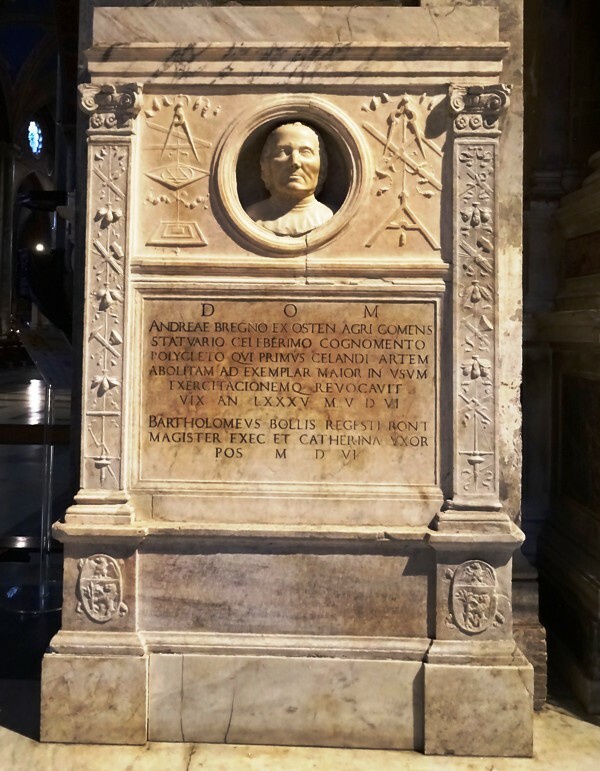 The monument was executed by Ambrogio Buonvicino (1552-1622), and although it is a niece piece of work, it cannot be considered the highlight of the chapel. That honour goes to the altarpiece, a painting of the Annunciation by Antoniazzo Romano (1430-1508). The painting is slightly unsual. Depicted are not just the traditional messenger angel and the Virgin Mary, but also God the Father (top left corner), a kneeling cardinal and three young women receiving dowries from the Virgin. The cardinal is the Spanish Dominican Juan de Torquemada (1388-1468). His nephew Tomás became the first Grand Inquisitor of the notorious Spanish Inquisition. Detail of the mosaic of Guillaume Durand’s tomb. One of the oldest tombs in the church is that of bishop Guillaume Durand (died 1296) in the Cappella Altieri. Durand was the bishop of Mende in southern France, but he seems to have spent most of his time in Italy and he died in Rome. The tomb is not in its original location and is rather high up on the wall. 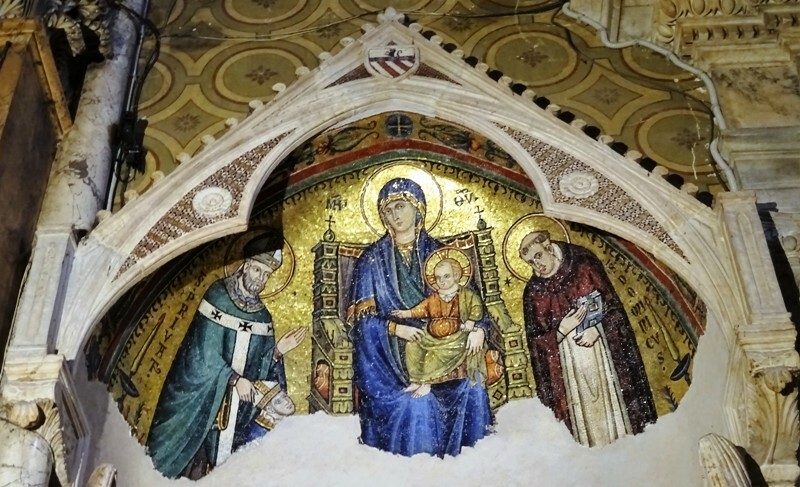 Its mosaic, partly damaged, is splendid and shows a Madonna and Child in the centre, with Saint Dominicus, founder of the Dominican Order, on the right and the third century Saint Privatus, the traditional first bishop of Mende, on the left. Durand himself is just visible to the left of the throne. Only his head remains, the rest of the mosaic is regretfully gone. The monument is the work of Giovanni di Cosma (died ca. 1305). Santa Maria sopra Minerva on Churches of Rome Wiki. One of my travel guides claims Raffaello da Montelupo finished the sculpture in 1521, but since the artist would have been just sixteen years old at that time, this seems somewhat unlikely. Update 5 February 2017: text and images have been updated.